Freshman Joel Farabee was named Hockey East Rookie of the Week after a two-goal, three-assist performance, including the game-winner in BU’s 5-2 win against New Hampshire. Sophomore Shane Bowers and junior co-captain Dante Fabbro were named to the Hockey East Weekly Top Performers list. During @TerrierHockey's undefeated week (2-0-1), sophomore d-man @KKotkansalo totaled 18 blocked shots with at least five in each game. ►Bowers slick goal on the backhand against Providence was USCHO’s #2 top play of the week. ►The Daily Free Press previews next Saturday’s home game against #6/7 Quinnipiac. ● Evan Rodrigues scored his third goal in Buffalo’s 7-2 loss to Edmonton. Recovered from last season’s severe injuries, Tommy Kelley is thriving with the ECHL Worcester Railers. 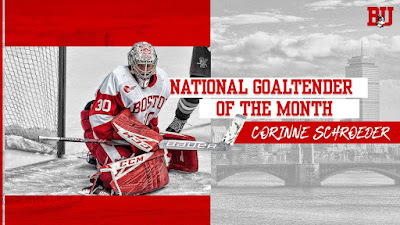 Sophomore goaltender Corinne Schroeder was named December’s National Goaltender of the Month by Women's Hockey Commissioners Association. In four starts, she went 3-0-1 with a 1.02 GAA and .964 save percentage. Schroeder also won Hockey East Defensive Player of the Week honors for her 58 saves in the weekend sweep of Providence. Deziray DeSousa and Kaleigh Donnelly were named to the weekly top performers list. Terriers are tied for third in the Hockey East standings with Providence. This coming weekend, they’ll play a pair of non-conference games against Holy Cross.